Buyers have 7 days to return item to me, but only if the item has been grossly misrepresented in the item description. The item must be returned in the same condition and all parts, accessories or paperwork must also be returned if the item required them. 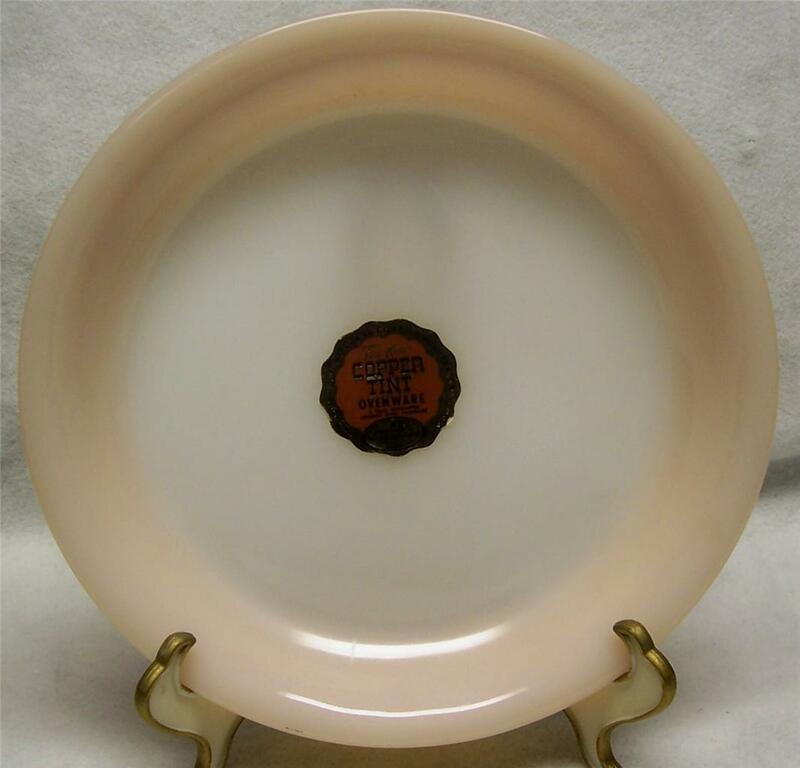 Fire King Copper Tint Peach Lustre Ovenware Pie Plate New w/Sticker Description Fire King 9" Copper-Tint (Peach Lustre) Pie Plate "NEW with original sticker" Beautiful 9" in diameter x 1 3/4" deep, pie baking dish from the Fire King collection by Anchor Hocking Company. This color, which is similar to the Peach Lustre used on dinnerware, is called Copper-Tint. Fire King made Copper-Tint ovenware from about 1958 to 1971. The bottom is embossed Fire King and TM Reg. Made in USA, 460, although it is printed in reverse. No chips, no cracks, no nicks, no stains. The color is strong lustrous. It does have a little of the color variation and straw marks associated with Fire King glassware. Clean, ready to use. View My Other Items For Sale Visit My eBay Store Payment PayPal is an eBay service to make a fast, easy and secure payment for all your eBay purchases. PayPal accepts all major credit cards and e-checks. E-checks take 7-10 days to clear your bank. PayPal will notify me when your check has cleared and I can then ship out your item. Payment should be made within 3 days. If you are actively bidding on more than one item I will wait till all auctions close, so that I can combine the items on one invoice and save you shipping charges by combining the items into one package. You must notify me if you are bidding on other auctions. View My Other Items For Sale " I LOVE SELLING ON EBAY...I LOVE ALL MY GREAT CUSTOMERS! " Shipping I ship your item out within 1 - 3 days from your payment clearing. I generate all my shipping labels through PayPal. All information on Tracking Numbers (UPS) or Delivery Confirmation Numbers (USPS) will be provided to you directly from PayPal. I do combine items together to save you money on shipping costs. If you are bidding on more than 1 item please let me know so I can send you a combined invoice for the items bid on and won. International Canada Buyers are truly welcome. Please, if you are not comfortable with the shipping calculator quote, email me and I will find the cheapest way to ship the item out to you. Generally it is USPS Priority International, but there is also other ways to go. If it is light in weight we can do USPS First Class Mail, or Flat Rate boxes. Please understand that shipping rates are high and I want you to enjoy bidding on the auctions so I will do my best to save you shipping costs. The shipping quote that I provide you will NOT include any taxes, duties or brokerage fees. These fees are the full responsibility of the recipient. Visit My eBay Store Terms of Sale All items come from a Smoke Free Environment This is an auction site...the terms are as any other auction..."As Is" condition. I do my best to describe the item as I see it and will note any flaws, dings, dangs or chips in my description that I can physically see with my eyes. I am human and can overlook things. What may be a minor thing to me might be a big deal to you. So I will let you know that if I have grossly misrepresented the item in my description I will glad refund you the money back in full. Remember this is only if my description if way off target. Item must be returned to me in the exact same condition it was sent to you. The parts, accessories and instructions must also be returned if the item required it. About Us All of my items come from a Smoke-Free Environment View My Feedback Feedback is a very important aspect of the eBay community and I believe that we should both be rewarded for our participation in this outstanding auction site. Once you have received your package from me. look it over and if your pleased with your purchase I would totally appreciate for you to leave me that feedback, and I will do the same for you. This confirms to me that the package did arrive and your comments left in feedback lets me know that the transaction was a success. If for any reason you are disappointed, please let me know so that we can work out the issue together before you leave any negative or neutral feedback. Once you post it, there is no way it can be deleted or retracted. I am a fun-loving and easy going person to communicate with. Generally I will call you directly, and we go from there. My goal is to be sure that all my customers are pleased with their purchases, and will do whatever is necessary to achieve that goal. My feedback score speaks for itself, so please take a look at some of the comments left by previous buyers. View My Feedback Contact Us If you have any questions about a particular item that is listed on my listings, you can write to me by using the "Ask Seller A Question" link on the main page. It is better to ask me about any concerns you may have insteading of purchasing the item only to find out it is not what you really wanted. So please, do not hesitate to ask me any questions. Visit My eBay Store On Aug-07-13 at 20:45:42 PDT, seller added the following information: FREE! Sellers: Add a FREE map to your listings. FREE!